What’s it about? After Tohru’s mother’s death left her orphaned and her grandfather moved in with her aunt for renovations, she’s stuck living in a tent in the woods. Despite this, she’s determined to make the best of it. Turns out, she’s been living on property that belongs to her classmate Yuki Sohma and his cousin Shigure. The two invite her to stay with them, but she soon finds out that there’s more than meets the eye to the Sohma clan. The previous Fruits Basket anime came out right around the anime bubble and was one of Funimation’s first licenses when they were expanding their brand beyond Dragonball Z. Directed by Akitaro Daichi, the anime and the manga (which was being released in English by Tokyopop) became worldwide hits and formative to many shoujo fans across the globe. Unfortunately, the manga artist Natsuki Takaya hated Daichi’s adaptation of her work—his frenetically paced comedy was a poor match for what she wanted to be a serious human drama—and the anime never continued past a convenient stopping point, rather than the story’s true conclusion. Most fans assumed they would never see the rest of the story animated. That’s what makes this new adaptation such a huge deal. It’s something we all wanted for years, but never thought we had. Now, with a new art style and a totally new staff—Takaya’s conditions for the new adaptation to be made—the whole story will finally come to the screen. Manga fans have been, naturally, thrilled at this new adaptation. But how will the first episode hold up for new viewers? I was lucky enough to see the theatrical screening with my dear friend and AniFem contributor Alexis, so I was able to check up on her perspective. She adored the two episodes they screened, and even sympathetically teared up when I started crying out of nostalgia. As I wrote, I also checked with her to make sure that I wasn’t bringing too much foreknowledge in, to keep this in step with our rule about basing the review on the first episode only. The heroine, Tohru, is a kind of protagonist that has largely fallen out of fashion in shoujo these days. Sweet, optimistic, and skilled with domestic chores like cooking, cleaning, and balancing the household budgets, she feels like she was written as an example of what young girls should aspire to. And true, there is some gendered behavior that borders on essentialism. Yuki and Shigure take Tohru in not out of the goodness of their hearts, but because they’re slobs and need someone (Shigure specifically wishes for a “high school girl”) to take care of them. To a modern viewer, she seems like she’d be more at home in a shounen romance as the “childhood friend” character type. But even in this first episode, there are clear hints that she has a greater complexity than her domesticity would lead critics to assume. She’s homeless because she doesn’t want to put anyone out, while attending school and working until late in the evening, all to keep a promise to the deceased mother she’s still grieving for. She pushes herself so, so, so hard, and little of it for her own benefit. It’s not just that she has an iron will, which she does, but that she’s self-sacrificing to a fault. She does this, all despite having the support of incredible people who would do anything for her, including her two best friends, Uo and Hana. Fruits Basket’s female friendships truly shine, and the first episode does an excellent job portraying the bond between the three misfits. 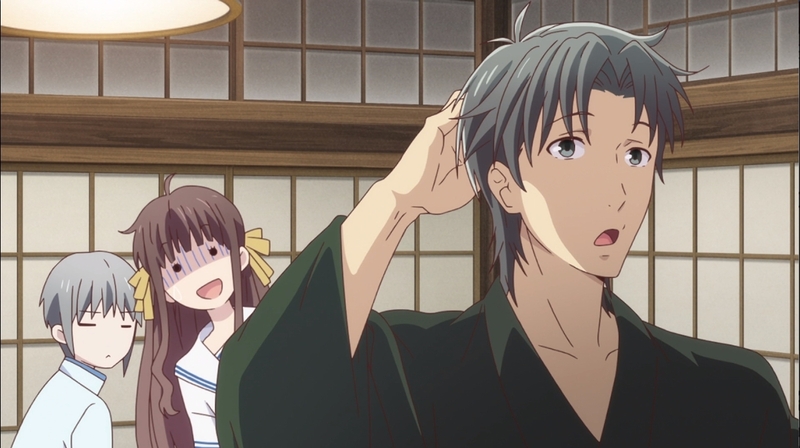 The one point of contention in the first episode is Shigure’s not-entirely-innocent interest in Tohru. The man is in mid- to late-twenties, and he can see quite clearly from Tohru’s uniform that she’s in high school. His obsession with teenage girls, played up as humor, echoes adult men’s fetishization with youth and vulnerability. It’s minor in Fruits Basket, but it’s still worth pointing out that it’s not funny or cute for adults to flirt with children. Ever. Under all the mysterious, magically transforming bishounen lies well-written, moving human drama, and based on the early episodes, this new adaptation should please old and new fans alike. It’s gorgeous and faithful to the source material; the only changes made is some extra foreshadowing and a fight where it actually looks like the artist knew what they were doing. Fruits Basket is a story of grief, loss, and healing, and I’m so happy to see it getting the full adaptation it deserves.